Nothing compares to the Zen-like warm feeling of freedom that washes over you when you realize that the day is yours to ride. I had that same feeling of freedom wash over me after I engaged the Tak-Lok Throttle Control the first time: Freedom from the right handlebar! Many people have experienced numbness in their hands when riding a motorcycle. Your left hand can find relief by removing it from the bar and shaking it out to allow feeling to come back. Your right hand is required to continue gripping the throttle during your ride. Using the Tak-Lok allows that same freedom for your right hand. It is a fabulously liberating feeling to be able to remove your right hand from the throttle and continue down the road. Honestly, after using the Tak-Lok Throttle Control, I wonder how I could ever ride any distance without it. Takonix Incorporated manufactures the Tak-Lok Throttle Control. They are located in St. Paul, Minnesota. That’s right, they are local guys! Further, the Tak-Lok Throttle Control is built from parts sourced in United States. In this day and age, that is a rare thing indeed! I first saw the Tak-Lok mounted on a handlebar at the parts counter of Moon Motorsports in Monticello. It appeared to be of very high quality. I decided to inquire further about the product. I contacted Jon Strom, one of the owners of Takonix. Two days later (!) Jon had a test unit on my doorstep. My thought after unpacking it was that it felt very solid and durable. The housing is made out of metal with a beautiful chrome finish. There is also a matte black finish if you prefer a more sinister look. The Tak-Lok comes with eight adapters to accommodate a wide range of throttle grip sizes (32-39 mm /1.25”-1.5”). The kit comes with a full complement of materials needed for installation. It also comes with a three year repair / replacement warranty for any failure caused by defects in material or workmanship. Installation is extremely easy. It consists of measuring your throttle grip, selecting the appropriate adapter, sliding that adapter on your throttle grip and installing the Tak-Lok over the adapter. The final step involves attaching the Tak-Lok release foot to your brake lever and adjusting the release point. It literally takes fifteen minutes and requires no drilling or modifications to the bike at all. Kudos to the guys at Takonix for designing the Tak-Lok to install so easily and cleanly! 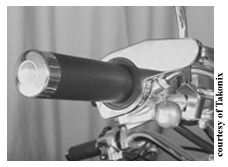 The Tak-Lok uses patented technology to hold the throttle in position. The control is engaged without having to remove either hand off the grips of the motorcycle. Simply roll your right thumb up off the grip and move a small lever to lock the throttle in place. Easy adjustments to the throttle are possible even with the lock engaged. This is done by simply rolling the throttle open or closed a small amount. Disengagement of the system is just as easy, either by moving the same locking lever to its resting position or apply the front brake. The entire system works with flawlessly simple elegance and becomes second nature within your first ride with it. The bottom line is the Tak-Lok is a high quality, functional piece of equipment and deserves your attention. The guys at Takonix are excellent, customer-oriented people who founded a local business using American parts and serving the sport we all love. If you are in the market for a throttle control device I would encourage you to check into the Tak-Lok. MSRP is $159. Go see it at Moon Motorsports or on the web at Takonix.com. Would like to purchase- have Honda 750..
Also left msg on phone #.